Bring Your Child to the Library Day! 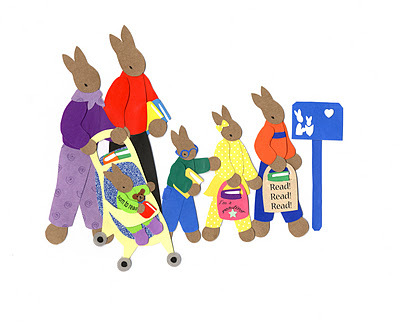 Saturday, February 4 is "Bring Your Child to the Library Day!" Face Painting will be offered from 10:30 am -- 11:30 am, and cupcakes and goody bags will be available while supplies last. ICDL, the International Children's Digital Library located at http://en.childrenslibrary.org/ , contains about 4,000 books in 54 languages. Its bright colors, design appeal, and search ease make it child friendly. Though titles cannot be downloaded, they can be printed on paper and viewed by a variety of e-readers. Many of the titles were originally published in the 19th century, but more current titles are being added including over 800 that were published in 2006. This is a valuable site for teachers, librarians, parents, and, of course, children. Its definitely worth a look! The calendar is ready and can be viewed by clicking on the picture to the right. You can also pick up a copy at the library or find it amongst your child's handouts from school. Of special note is the Wildlife Tracking program with Lynn Levine on Monday January 23 at 2:00 (a no school day) and "Bring Your Child to the Library Day," Saturday, February 4.